What does the term "lock" mean in the world of poker? 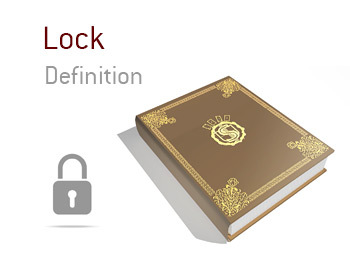 What is the definition of the term "lock"? In poker, a "lock" occurs when you hold the absolute nuts and can not be beaten in a hand. In other words, you are a "lock" to win the hand. Surprisingly, there are still two other players in the hand on the river, despite the fact that you've led out on every straight with your hands. You figure that they both probably have full houses based on how the hand has played out. In this situation, you are a "lock" to win the hand, as there is no other hand that could beat you. There are no straight flush or royal flush possibilities on the board, which means that your Quad aces are unbeatable. It's important to note that a "lock" occurs when there is 0% chance of you losing the hand (aside from if you fold, of course). Holding pocket Aces pre-flop doesn't make you a "lock" to win, as anything could happen after the flop is dealt. Sure, you will be ahead in the hand pre-flop, but you will certainly not be a lock to win.